Imagine. You’ve just come from Lake Tahoe with your family. You’ve had great time. You and your family want to make a quick stop at home to rest. Maybe you have plans later to go to the casino or golf course or out with friends, when the worst happens. You lost your keys. You are locked out. Your key just broke in the lock. Regardless of what just happened, you need help from a locksmith–immediately. This scenario is a true crisis. Forget your plans for the rest of the day. You need help immediately. You do not have time to schedule an appointment and wait patiently for someone to help you. Many locksmiths cannot help you. They seem to keep office hours. This means that if you need locksmithing services late at night, early in the morning or on holiday, they are not open to take the call. Did your key break off inside your van’s ignition? Locked out of your place? Lost your key fob device? One of our locksmiths will meet you within minutes to resolve your lock-related issue. Business locksmith services: We are proud to offer business locksmith services to resolve any issue you have in an expedited way. Whether you need high security services, chip keys, worn out locks that need to be replaced, we can do that for you at an affordable price. .Residential locksmith services: The place where you live must be safe and secure at all times. We work to achieve that goal immediately when a crisis lock-related situation arises. It does not matter if you need a simple lock change or something complex like high security for your place. .Postal box locksmith services: You may not think that locksmithing includes securing your mail, but it does! We work on you worn-out keys and locks, install new locks and resolve lock out issues when you do not have a long time to wait. We are your courteous, affordable and fully licensed shop in Nevada to resolve your mail box lock issues. .Automotive services: You cannot live without your vehicle. You have places to go and things to do. Any time you do not have access to your vehicle, you are wasting time and money. Whether your keys are in your vehicle or you need chip keys, we can resolve your automotive lock-related issues. What are the Common Type of Locksmith Emergencies Near Me? .Broken key extraction: A change in weather can lead to keys breaking inside the lock. Here we resolve a lot of broken key extraction issues because of keys that are worn out and vulnerable to breakage. This can happen to your ignition lock, car lock or apartment lock. Regardless of where this happens, you can count on us to be there to fix the problem. .Truck unlocking: It can happen at any moment. You may forget something or you are distracted. Suddenly, you realize your keys are locked in the trunk of your vehicle. Do not worry. Call us and we will unlock your truck and get you back on the road in no time. .Transponder keys: Automobile makers have manufacturing cars with transponder computer chips inside keys since 2004. The goal of these transponder computer chips in the keys is to make vehicles harder to steal. Also, to increase security for your vehicle, the makers also made it difficult to duplicate the transponder. This does not mean you cannot lose your transponder or leave it in the ignition after locking the vehicle door. We are available 24 hours a day, 7 days a week to help you create a duplicate transponder or resolve transponder issue. .Lockouts: Lockouts are the most common emergency lock situation. This can happen when you leave your keys in your vehicle, bedroom, place of residence or business and are locked out. You have no way to gain access to the interior of the property. Keys accidentally locked in your vehicle? Need a lock repaired at your business? Want new locks on your file cabinets? We are your 24/7 technicians. Call us at (775) 507-7177 for immediate help. No one wants to go through a vulnerable situation such as a car or house break-in. It is a devastating experience. If your lock was picked, glass entryway broken or door burst through, you need an emergency locksmith to restore safety and security for you. Your emergency may include simple rekeying or something more complicated like a full lock replacement. It does not matter how simple or complicated your emergency situation, our team will respond fast and attend to your lock-related issues. We want you and your family to feel more secure than you did prior to the break-in at your property. If you are locked out, our locksmiths are available 24 hours, 7 days a week to program a new transponder key for your vehicle or new place of residence for you right on the spot. Our reputation for quick response to emergency calls makes us a leader in Nevada. Call us and we will be there to assist you immediately. Do You Need Your Key Fob Replaced Immediately? A key fob is one of those luxuries no one should ever live without. You no longer must manually unlock or lock your motor vehicle. When your device stops working properly or is missing, it can strike panic in your heart. Do not worry. Your key fob can be replaced or repaired quickly. It does matter if the device was a new type of remote ignition starter, smart key or one of those old school door openers. It can be resolved. For instance, we can remove the motor vehicle’s onboard computer to get rid of the missing or damaged key fob. This ensures that your old device no longer works in the vehicle. We then replace it with a new onboard computer system and new device. This comes in handy too when another person has access to your vehicle who is no longer permitted to us it. Emergencies happen a lot with automobiles. You may be locked out of your automobile or can’t unlock the truck. When these emergencies happen, count on us to assist you. We can give you access to your car’s truck or car quickly. Our experts are highly trained in locksmithing. We carry all special tools need to gain access to your vehicle in case of crisis lockout. 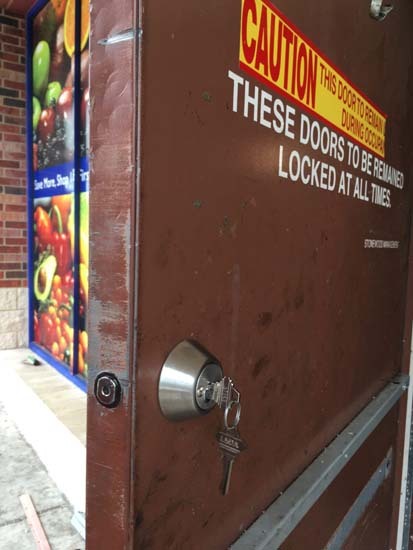 In case of a commercial or residential lockout, we have the special tools needed to gain entry without causing further damage. With our courteous, fast and on-site quality service, we will respond to your call quickly. Day or night, we provide you with superior service at a time you need help the most. If you a lock is your problem with your vehicle, let us fix it for you. When you are in a crisis situation where you need a lock-related issue resolved yesterday, you may wonder, “Should I go with a locksmith near me or one from a national chain?” The answer is simple. You want a local locksmith service with a fully licensed shop and highly trained technicians. You want our locksmith service. Our quality on-site service is only second to our affordable rates. All of our staff are reliable, friend and eager to help you resolve your lock-related issue. Whether you call us at 3 p.m. or 3 a.m., you know that we will answer the call and work quickly to resolve your lock issue.